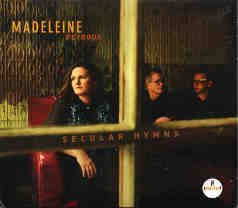 George Graham reviews Madeleine Peyroux's "Secular Hymns"
In the early 2000s when Norah Jones had commercial success with her jazzy chanteuse styled vocals, there appeared quite a few other jazz-influenced women vocalists around the time. But there has been one young young female artist in the style goes back to the 1990s, and has also enjoyed some commercial success. Madeleine Peyroux is perhaps the epitome of the chanteuse singing in the Latin Quarter of Paris with a band while she was in her teens. Born in Georgia, she spent her adolescence in Paris where she sang on the street and the cafes, as part of a group called The Riverboard Shufflers, and at age 16 a joined an outfit called The Lost Wandering Blues and Jazz Band with whom she toured Europe. In 1996, she released her first full album in the US Dreamland, which attracted a good deal of attention for her vocal style that drew on the influence of Billie Holiday in an almost uncanny way. But after that album, she more or less disappeared from the public eye for nearly eight years before releasing Careless Love which sold over a million copies. Since then she has been releasing nicely-made albums every couple of years, with each having some distinguishing musical direction. Although she does write songs, her output in that respect is rather sparse. She is best-known for her creative covers of tunes from a wide-range of sources, from Tim Pan Alley standards to romantic versions of rock tunes. Now at age 42, Madeleine Peyroux is out with her latest recording called Secular Hymns. Although her records were never known for their over-produced sound, for this album she worked with a bare-bones trio, recording everything live over two days in a very old church in England. This project started, according to her liner notes, in October 2015, when she was booked to appear in an English village named Great Milton, in a church she describes as going back to Norman times. She was enchanted by the environment and the sonic qualities of the church. When it came time to do a new record, she gathered together two musicians with whom she had been touring on and off for some time, bassist Barak Mori and guitarist Jon Herrington, who plays mainly electric guitar while Ms. Peyroux plays acoustic. They went back to the church in January 2016 and recorded mainly live over two days and also gave a free concert for the village residents. Like her past records, the material she covers is a mix of the familiar and music that is well off the beaten path, but which proves to be a good match. In this case, it’s some old blues tunes, a couple that are near Gospel in sound, a Tom Waits composition, a country honky tonk tune, and a one by Stephen Foster from the 19th Century. It’s all very well done and it strikes me as being impressive for the variety of sound and moods that happen on the record with such a scaled back group. And as usual, Ms Peyroux gives it her distinctive, charming vocal style. Interestingly, as she gets older she is sounding less like Billie Holiday. The album ends with an old Gospel song called Trampin’, performed solo by Ms Peyroux. It’s a nice combination of influences with the spiritual lyrics and Ms. Peyroux’ jazzy, vaguely world-weary vocals. Madeleine Peyroux has been one of the most appealing of the newer generation chanteuse styled vocalists, though by now, she has become one of the veterans with her debut album having been released twenty years ago. Her new recording Secular Hymns is something of a departure. Her other albums have generally been understated in their production, but this one consists of just Ms. Peyroux and two band-mates recorded in an old church essentially live. Like most of her previous albums the material is an eclectic mixture of cover songs, with this one featuring an especially wide collection of material for the minimal instrumentation. She remains as appealing a vocalist as ever, with her maturity evident, with her developing her own voice and not showing so much of the influence of Billie Holiday as was the case on her earlier albums. We’ll give the recording a sonic quality grade of close to an “A.” The sound is warm and appealing and the recording depends to a greater extent on the natural acoustics of the church. The dynamic range, how the recording maintaines difference in volume, is reasonably good for something in this day of hyper-compressed recordings. Madeleine Peyroux carries on what I suppose could be called the neo-chanteuse school, and does it very well on her intimate-sounding new album.